Prescott, AZ knows how to party! 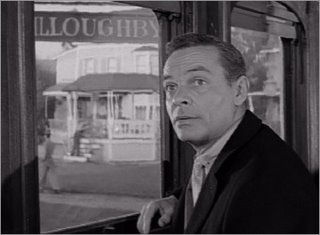 Living in this town for the last several years reminds me of the late Rod Serling’s 1960s television series, The Twilight Zone…specifically, Season 1, Episode 30 – A Stop at Willoughby, where a businessman stressed from a miserable city life starts to imagine visiting an idyllic small town named Willoughby. Prescott is better than Willoughby; there is scarcely a weekend when something isn’t happening downtown. Tonight it was Acker Night. Surprisingly, Acker night (named for its benefactor and for the benefit of local musical programs) does not seem to be as widely known outside of Prescott as I imagine that it could be. 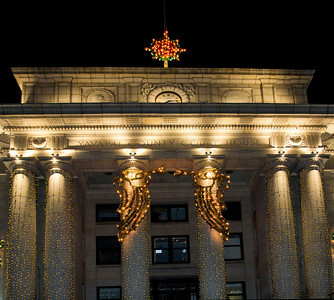 During one night every year in December, all of the town’s businesses stay open until 8:30 serving holiday treats, and hosting musicians of all genres. But Susan won — she was hungry and wanted to try the Indian Buffet at the Taj Mahal Restaurant. When we walked in we were greeted like family. On the way to the buffet, I looked to the right and saw the scene at the top of this blog entry as well as the scene below. The food was great too! …and rewarded again –because next, Efren Puig performed. I don’t know why I like this guy so much. Something about his eyes when he sings makes me believe in whatever he is selling. It’s a good thing he didn’t ask me for my checkbook. Today I would be calling my son for a loan. 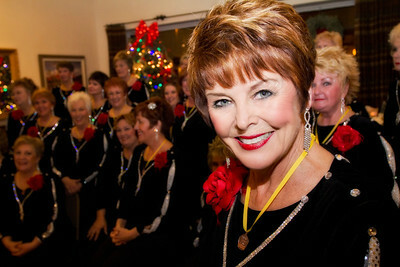 Mike and Susan found me shortly after I arrived at the Music Café and so we headed east again on Gurley to the Hassayampa Inn to see the Song of the Pines Chorus. Last year, Prescott resident Toni Tennille walked in causing a bit of a stir here at about this time. I love this group and this setting could not be more perfect for them. In my younger years, I would have seen a beautiful image ready to be captured and would be too embarrassed to do anything about it. This, for example happened in Krakow, Poland over a decade ago and I promised myself it would never happen again. So, I stepped in front of the crowd and approached the director to get a shot (a necessity, as I was sporting a 17-40L wide-angle lens). For a moment, there was trepidation in the looks of some of the chorus (maybe it was the Russian hunter’s hat). Then I raised my camera, about three feet from Suzy Lobaugh, the director and all previous sins seemed forgiven. I was able to get this great portrait as she warmed immediately to the camera. Now, Mike had wanted to see the show at the newly remodeled Prescott Elks Theater, since we missed it last year. As we approached the theater, we could see that we had just missed the 8pm show, featuring PK Jugg’s Uptown Shenagan Band, so we decided to walk around the square for 30 minutes or so and come back to see if we could catch the last show for this year at 8:30. 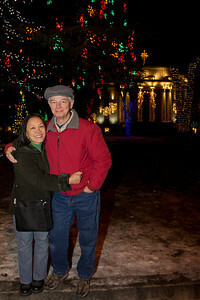 We made our way across the courthouse square; Susan wanted to see if a friend from work was still performing. The Yavapai County Courthouse sits in the middle of the town square. The informed reader will recognize this building from many movies, including Easy Rider and Billy Jack. We found Joe Bethancourt at the Kikkapoo Express on Whiskey Row. We continued looking for Joseph Leal. 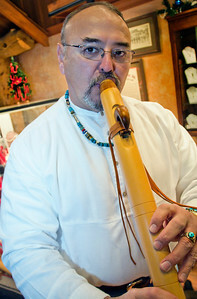 I have met Susan’s friend and Native American Flute Player, Joseph Leal before. The talented man with several very credible Native American flute music albums was just packing up after three hours on the job. I made this image as we were running out the door to get back across the square to the Elks Theater. Joseph was playing at The Artful Eye Jewelry Design Center. It was good to see him again. Leaving all hands happy, we walked right up the street and into the line filing into the theater. We overheard one of the ushers mention that the seats were particularly good upstairs. At the top of the stairs, Mike peeked behind a curtain and motioned for me to follow. Box seats! The show as fun, with a host of song parodies. The Band ‘rapped’ up the set with an audience participation number. Take a look for yourself to see how Acker Night was wrapped until next year. See you then!